Two reports produced by Landward Research for the Green Skills at Vocational Education project have been published. 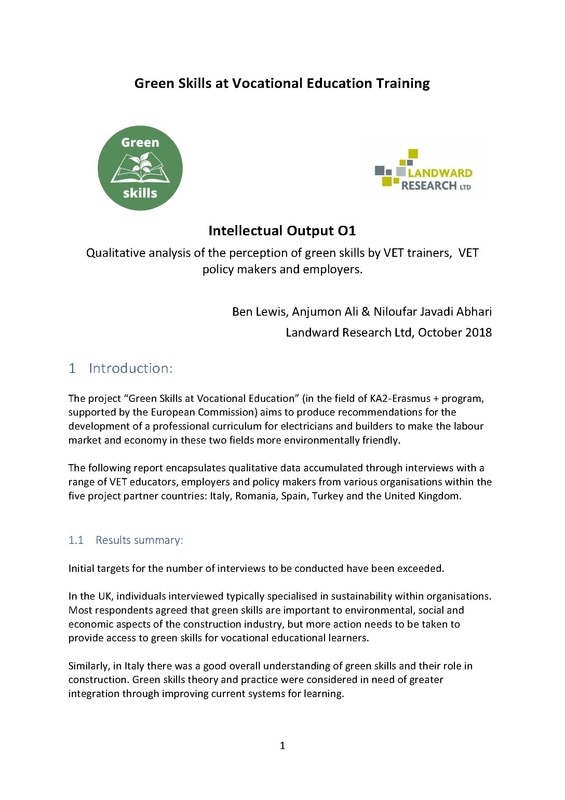 The first is a Qualitative analysis of the perception of green skills by VET trainers, VET policy makers and employers. This represents the results of analysis of 73 interviews with VET educators, employers and policy makers in five countries – Turkey, Romania, Italy, Spain and the UK. Written by Ben Lewis, Anjumon Ali and Niloufar Javadi Abhari, this identifes attitudes and trends in vocational eduction and training relating to green skills for construction workers and electricians. In the UK, individuals interviewed typically specialised in sustainability within organisations. Most respondents agreed that green skills are important to environmental, social and economic aspects of the construction industry, but more action needs to be taken to provide access to green skills for vocational educational learners. Similarly, in Italy there was a good overall understanding of green skills and their role in construction. Green skills theory and practice were considered in need of greater integration through improving current systems for learning. In Romania, green skills are provided in the curriculum but are not well-known by students due to a lack of didactic framework, hours and specialists. All three target groups consider green skills important, but currently they are not a priority of education providers or students. There is a discrepancy between the green skills competencies of the workers and the demands of the employers. Work projects tend to implement those green skills which create immediate financial benefits rather than those with long-term effects. In Spain, most participants again agreed that green skills were important to the construction industry, however they feel that they are accompanied by an economic burden. Participants consider that the government should provide economic assistance to companies, and through this improve the system of green skills vocational education and training. In Turkey however, many participants were unaware of the term ‘green skills’. Employer participants consider green skills to be an important issue, however current economic problems within the industry mean that employers don’t focus on the environment, which is viewed as costly and a burden on resources. As in Spain, many participants believe the government should be responsible for environmental issues, however here there was a belief that penalties and financial encouragements are more important than improving green skills training.